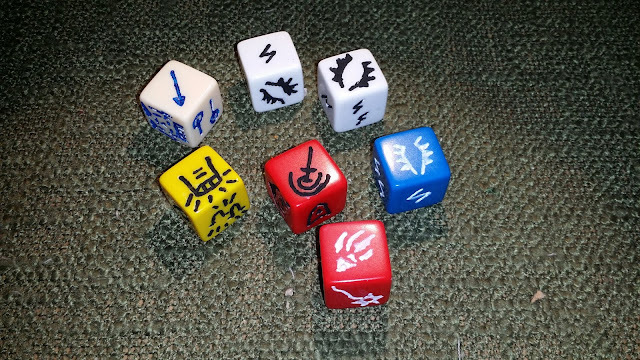 SFR, Inc. :: View topic - Custom Dice: "Heroes"
Posted: Sat Sep 30, 2017 8:52 pm GMT Post subject: Custom Dice: "Heroes"
I have this compulsion to customize every game that I own in some way or another, so of course, I've made some of my own custom dice to add to my personal copy of the game. I call them "heroes" and each is unique (more or less-- there are a couple I have made doubles of.) I haven't play-tested them, and since I only can seem to find blank, single-color 16mm dice (no 18mm or 20mm dice, and no mixed colors) they are all single-element, 1HP units. Boring, but I like 'em all the same. The process of making them is simple, but pretty time consuming. I use a fine-point sharpie to create thin guide lines, then engrave them out with the finest dremel head that I have. Each die takes about 15-30 minutes to fully engrave, and about another ten minutes to pick out the lines with paint. I don't have the equipment, skill or expertise to make anything close to the the level of detail we see in the official dice, but I do enjoy making these little, simple designs. 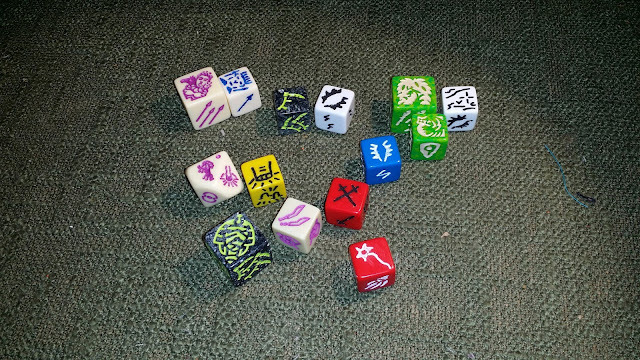 What follows is a picture of some of the other faces and the dice and a photo of my custom dice side-by-side with some of the SFR dice from my collection, for comparison. Thank you! I hope to find the time to make more this week or next. When I do, I'll definitely post pictures! Perhaps the hardest part is drafting designs that are clear and that look good on 16mm die faces (a very small surface to work with!) but that utilize lines no smaller than the level of thickness of my dremel head. It's tricky, but I'm intent on doing it! 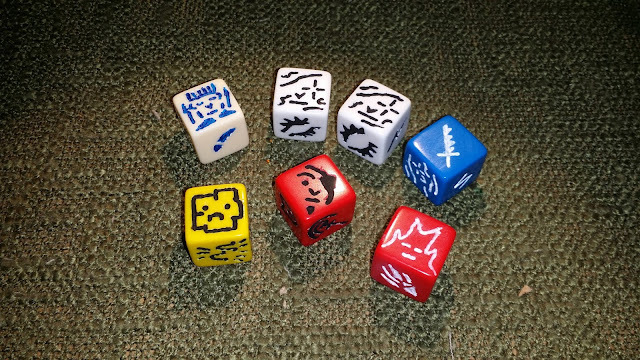 I'm also on the look out for other types of blank dice, especially in the 18mm and 20mm size, and in different color combinations, so if anyone has any ideas or leads, send them my way. One of the things I would like to do at some point, if I can find a really big blank 12-sided piece of stone or wood, is make a really large Drake. if I can find a really big blank 12-sided piece of stone or wood, is make a really large Drake. You mean like this one? 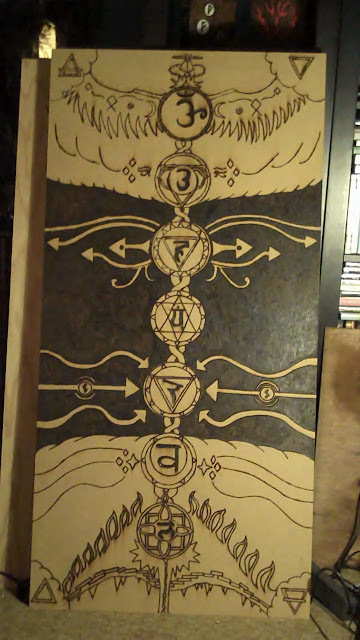 I made this years ago and it's still in my garage. Nice! Yeah, that looks like it would do the trick! Heck, if the wood is soft enough, one could engrave it / burn it with a soldering iron to make a pyrographic dragon! I've done similar, larger-scale projects like that before. I may have to create a set of my own champions to play around with the concept... it seems creative minds think alike... must... customize... everything!